By registering with MyPuppy School, you not only get access to training videos and great advice, you'll receive the MyPuppy Kit absolutely free. 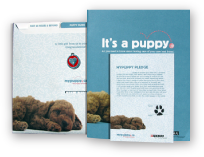 You'll also receive monthly emails tailored to key stages of your puppy's first 12 months. When your puppy turns one you'll receive a Happy Birthday email welcoming you to the Pet Priority® program for dogs!